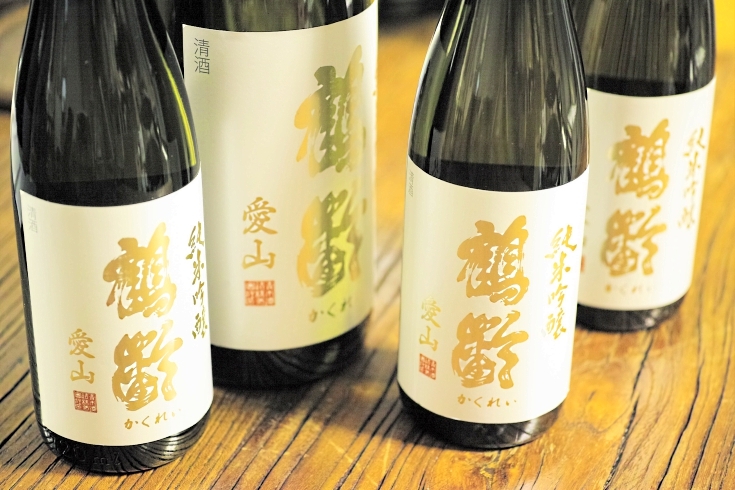 Rare and noble sake rice "Aiyama（愛山）" by Kakurei - Aoki Shuzo（鶴齢・青木酒造）. This is a Junmaiginjou polish rate 57%, aged in snow cellar. "Aiyama（愛山）" was born in 1941 between Aifune 117（愛船117） and Yamao 67（山雄67） - both belong to family of Yamada Nishiki（山田錦） and omachi（雄町）. Grains were bigger and taller than Yamada Nishiki（山田錦）, so quality was excellent but it was not easy to grow them, then eventually Akashi Agricultural Laboratory decided to stop it. However Kenbishi Shuzou（剣菱酒造） liked "Aiyama" very much and had carried on cultivation with contracted farmers exclusively until mid 90's. Unfortunately Kenbishi Shuzo（剣菱酒造） suffered from The Great Hanshin Earthquake（阪神大震災） in 1995. Their sake making was interrupted and cultivation of Aiyama has also been suspended. After a while Takagi Shuzo（十四代・高木酒造） got a chance to revive Aiyama（愛山）, and they have multiplied yield little by little. The amount of harvested crop is still small, so Aiyama is allocated to few top breweries only.